The Global Volcanism Program has no activity reports for Rakkibetsudake [Demon]. The Global Volcanism Program has no Weekly Reports available for Rakkibetsudake [Demon]. The Global Volcanism Program has no Bulletin Reports available for Rakkibetsudake [Demon]. 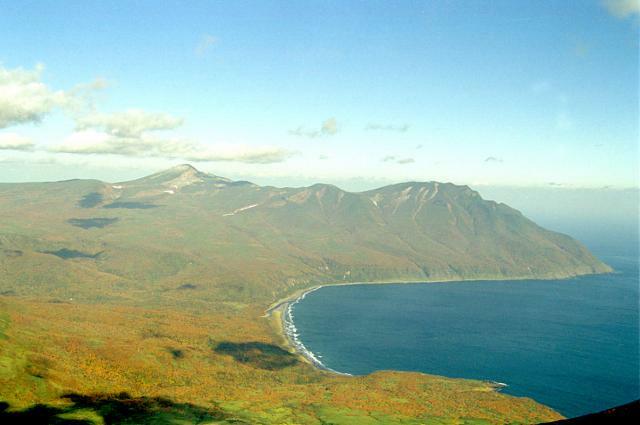 Rakkibetsudake [Demon] volcano occupies the extreme northern tip of the largest island in the Kuriles, Iturup. The 1205-m-high stratovolcano grew during the Holocene within a glacial trough 3 km east of the eroded Pleistocene Kamui volcano. The summit contains a 1.5-km-wide crater open to the east. The Global Volcanism Program is not aware of any Holocene eruptions from Rakkibetsudake [Demon]. If this volcano has had large eruptions (VEI >= 4) prior to 10,000 years ago, information might be found on the Rakkibetsudake [Demon] page in the LaMEVE (Large Magnitude Explosive Volcanic Eruptions) database, a part of the Volcano Global Risk Identification and Analysis Project (VOGRIPA). There is no Deformation History data available for Rakkibetsudake [Demon]. There is no Emissions History data available for Rakkibetsudake [Demon]. Demon volcano, forming the peninsula at the right, is seen from the summit of Sredniy volcano of the Medvezhia volcanic complex. Demon occupies the extreme northern tip of the largest island in the Kuriles, Iturup. The 1205-m-high stratovolcano grew during the Holocene within a glacial trough 3 km east of the eroded Pleistocene Kamui volcano, the higher peak on the left horizon. The summit of Demon contains a 1.5-km-wide crater, not visible in this image, that opens to the east. Photo by Alexander Rybin, 1995 (Institute of Marine Geology and Geophysics, Yuzhno-Sakhalin). There are no samples for Rakkibetsudake [Demon] in the Smithsonian's NMNH Department of Mineral Sciences Rock and Ore collection. Large Eruptions of Rakkibetsudake [Demon] Information about large Quaternary eruptions (VEI >= 4) is cataloged in the Large Magnitude Explosive Volcanic Eruptions (LaMEVE) database of the Volcano Global Risk Identification and Analysis Project (VOGRIPA).